I don't know if there is any TV more bizarre than Japanese TV. It almost makes me want to learn Japanese. I enjoyed "The Happy Family Plan" (Shiawase Kazoku Keikaku) because it gave you a glimpse into the actual home life of the contestants as the father spent a week learning to master a skill. But I but had to quit watching it because I couldn't take the disappointment when they lost, which they did quite often. I have enough disappointment in my life without importing more from Japan. 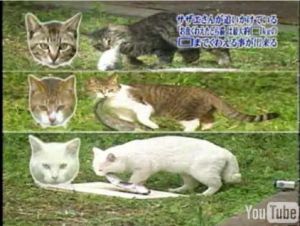 This particular video appears to be a sort of feral-cat Olympics. The best part is that the commentary sounds like typical sports commentary and analysis. I can just imagine them comparing the styles and analyzing techniques. The only thing that would make it better would be subtitles.